Do you remember loulou Tutu? The shop with the most amazing handmade Halloween tutu costumes that I posted about for the Halloween Bash? 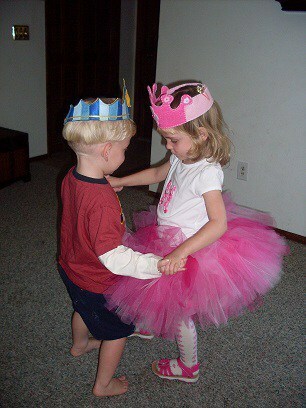 I can’t wait to show you the pictures of my daughter wearing her custom-made birthday princess tutu set by loulou Tutu. When I saw this set online it was so pretty that I knew it would be perfect for Hannah’s birthday outfit. What I didn’t expect is that this tutu set was even more beautiful when it arrived and I could see the quality of the workmanship. 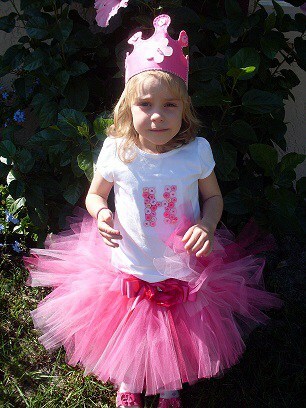 I loved that this personalized tutu set can be customized with any color combination that you desire and you can even choose the length. All of loulou Tutu’s tutus are hand tied, knotted and machine sewn below the elastic waistband so this set can be worn for a long time. The shirt was so soft and the hand appliquéd buttons can display a letter or number. I appreciated the sizing list on the website to help pick the perfect size but my daughter is very tiny for her age and Jenny was so responsive to helping me pick the right fit. This tutu set by loulou Tutu was my daughter’s first gift for her 4th birthday and she was so excited and appreciative. She asked me if she had turned into a princess for her birthday and I told her that she was always a princess but for her special day she could even dress like one. My daughter has severe health issues related to her asthma so it was such a wonderful feeling for me to see her dressed up so pretty, feeling healthy and confident and beaming from ear to ear. Once she was ready, her dad, brother and our boxer were assembled in the living room for her “grand entrance.” As she walked out to their “drum role” I noticed my husband had tears in his eyes and she enjoyed a first dance with her little brother (who was turning three). Hannah refused to take off her tutu set all day and even fell asleep in it that night. There are so many things in her life that I can’t control but being able to make her feel special for even one day means the world to me. Loulou Tutu has a fantastic selection of high quality tutu’s and accessories and if you don’t see exactly what you are looking for then don’t hesitate to contact Jenny for a custom order. I am confident that you won’t be disappointed and your order will far exceed your expectations. Check out the loulou Tutu Facebook page too to get up to date information about her latest creations.